May 2 is National Truffle Day. This day honors deliciously sweet chocolate truffles, that everyone should enjoy today. 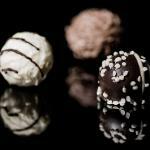 Truffles were developed in France as a small chocolate ball made of ganache and rolled in cocoa. It was named after truffle fungus, that chocolates resembled. It is believed, that truffles were made by August Escoffier during the 1920s. One day his apprentice tried to make a pastry cream but accidentally poured hot cream into a bowl of chocolate chunks instead of the bowl of sugared egg. When chocolate and cream mixture hardened, Escoffier found, that he could form a lopsided ball with his hands. He rolled his creation in cocoa powder and was surprised with its resemblance to real truffles from France and Italy. The concept developed further and different fillings, as well as covers, were made. Truffles can be filled with anything: cream, caramel, melted chocolate, fruit, nuts, fudge, nougat, mint, marshmallow, liquor. It became possible after Belgian chocolatier Jean Neuhaus invented hard chocolate shell. There are different types of truffles: European, Swiss and American. American truffles were created in the 1980s in San Francisco by Joseph Schmidt. His truffles had a half-egg shape with chocolate covering a mixture of dark and milk chocolate, butterfat and coconut butter.